Intended use: All runs except in bad weather. Best used for tempo runs, long distance road racing. Upper: Spacer mesh, synthetic leather, Flywire cord based lacing. Midsole: Compression molded EVA midsole, plastic shank, heel Zoom Air bag. Outsole: Heel carbon rubber, blown forefoot rubber (Duralon). One of the few distance running flats available with a relaxed forefoot fit. Use of thick forefoot rubber also increases its versatility as a daily trainer. Very lightweight too, at a mere 7.2 Oz for a half pair of size US 11. The Nike Zoom Streak 5 is one of two oft seen shoes on Elite Marathoners in marathons. The other shoe is the adidas Adios Boost. There’s a small amount of, and justified hype around what shoes Elite distance runners wear when they cross the finish line in marathons. With good reason too; Elites lend a stamp of authenticity to the gear they wear, never mind the fact that they would have delivered the same performance in any other shoe of their choosing. Nonetheless, within this realm of micro-hype, two shoe models shine bright. The first being the adidas adios Boost, a distance running shoe with a more-than-usual dose of cushioning, and second, the Nike Zoom Streak. 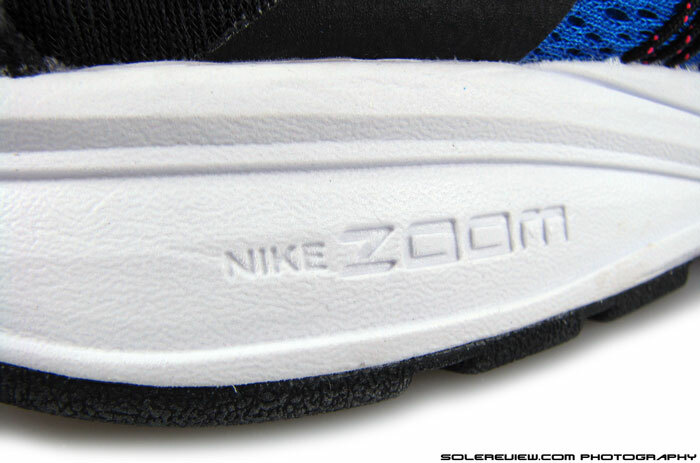 The reflective heel strip underscores the Zoom Streak’s distance racing focus. That’s how the reflective piece looks like in dark. So does this mean that these models are the best distance racing shoes you can find in the market? No. Remember that Elite athlete shoe counts in marathons are mostly a direct consequence of brand endorsements, and athletes have no choice but to wear something from a shoe company which cuts them a cheque. One way to view the situation is that these models are perhaps the best out of what the brand in question could offer, and while not perfect, the shoes serve their purpose pretty well. Tell tale characteristics like light weight, snug fit, breathability and a low profile midsole make these shoe conducive to distance road racing. The fit is surprisingly relaxed for a distance racing shoe. The Flywire cords skip the first row of eyelets, opening up some space in the forefoot. 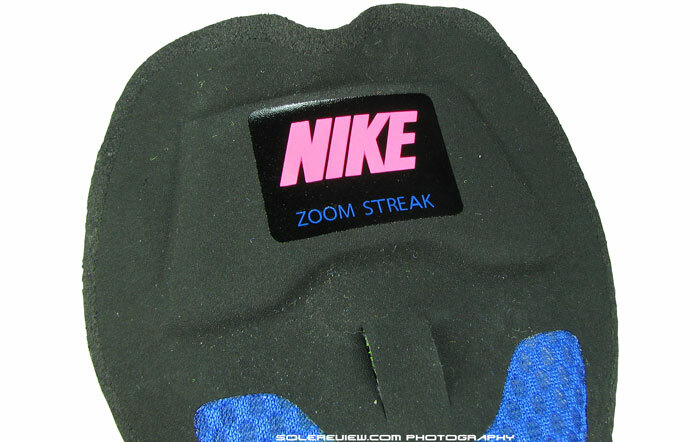 The Zoom Streak 5 has a namesake Air bag inside its heel. And yet, the adios Boost and Zoom Streak 5 couldn’t be more different in character. The adios is super snug all through, has a rubber-on-fabric forefoot outsole and comes equipped with Boost infused cushioning. On the other hand, while the lighter (207 gm/7.3 Oz) Streak 5 comes with standard accompaniments such as a well ventilated upper, heel Zoom Air bag and overall minimalism in design, the fit is actually relaxed in the front. Of course, the word ‘relaxed’ is relative and is used in distance racing context, the Zoom Streak 5 feels much more relaxed compared to say, an adios Boost. It also has a rather thick, blown rubber outsole under the forefoot, which comes with its own positives and negatives – something which we’ll talk about in a while. 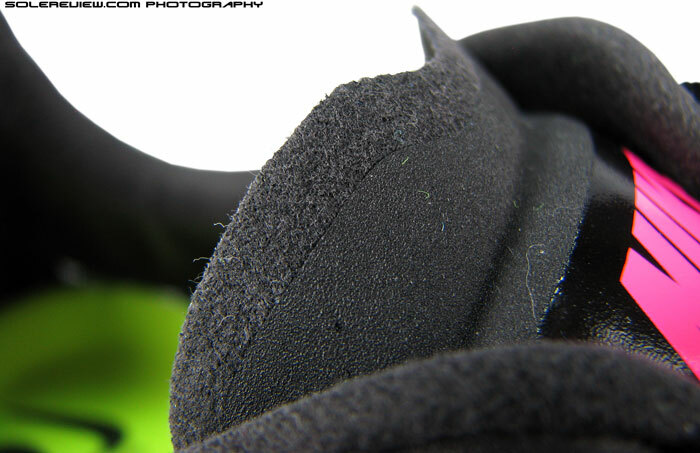 The medial (inner) face of Streak 5 has a clean profile, no logos. This is one of our reviews in which we hadn’t had a chance to test the prior version(s). Which means we’ll devote all our time focusing on the 2014 Zoom Streak 5, and comparisons, if any, will be made to the Adios Boost, given the preface we’ve laid out in earlier paragraphs. No overlays on the breathable forefoot, and ‘made for electronic media logo’ splays large. A fused rearfoot layer bonds the two types of upper mesh together. The Nike Zoom Streak 5 is extremely lightweight. The pair tested was a US 11, and it came in just over 200 grams or 7 ounces, and we’re willing to bet that a size US 9 would be sub 200 grams or 7 ounces. To amount to that number requires a specific set of design elements, which the Zoom Streak adeptly blends together. To begin, the upper is extremely minimal, with a sandwich mesh forming majority of it, sans bulky overlays – except for the giant Swoosh logo. The material changes at the rear, and connection is made by a thin layer of welded synthetic, which helps the lightweight cause. 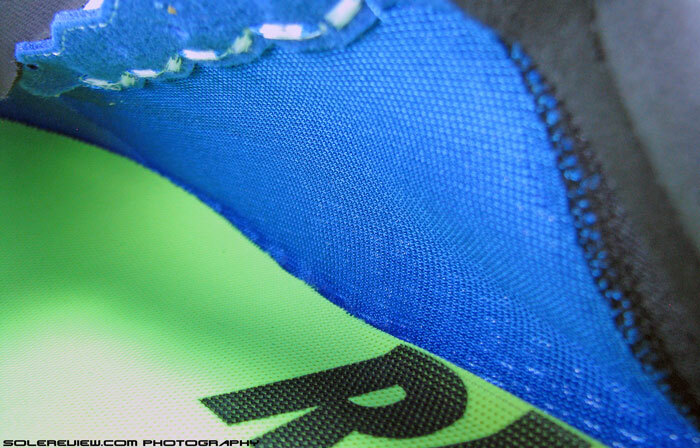 The eyelets are reinforced with a filmic overlay laminated over mesh. The Flywire cords are guided by a pair of tacks. There are other examples of weight reduction measures throughout the shoe. The upper eye-stay reinforcement is a result of a transparent, filmic lamination over the mesh, backed by another layer of soft synthetic inside. 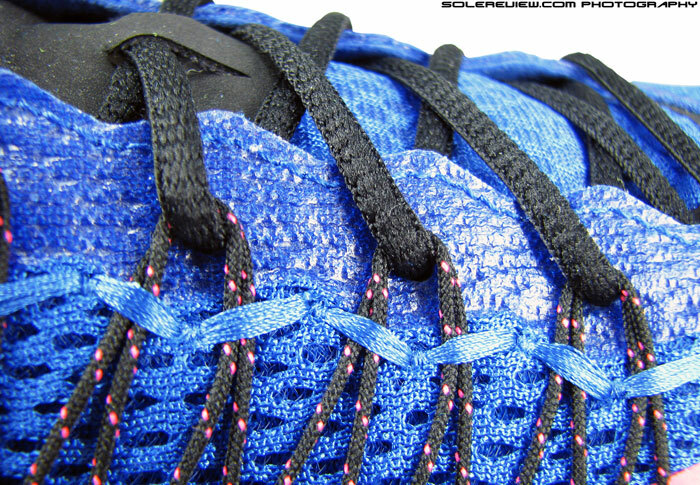 Eyelet holes are punched into this toughened section, and thin laces pass through them and the Flywire loops. The cords extend upwards from the upper base, and over the upper. They’re guided into place by a pair of tacks, which also prevents the cords from sinking in case you choose to skip lacing through them. Only the tongue top area is padded is foam. Most of the tongue uses a single layer, breathable mesh. Tongue lip has this soft synthetic, which prevents poking. Tongue is padded near the top which helps take off the lacing pressure around the top, and the edges are lined with a soft synthetic. This treatment extends alongside the entirety of edgeline, helping the tongue lay flat over the foot inside. 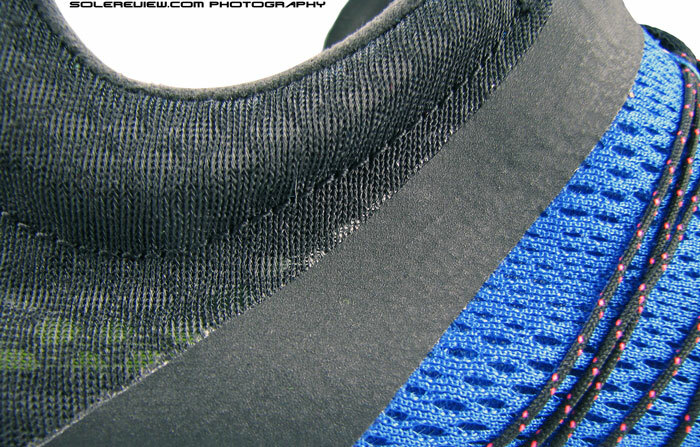 This also prevents the curling of tongue edges inside the upper, a problem faced in the Adios Boost 2. The result is a flatter, flush over the foot fit, which feels great. There’s a slight amount of tongue slide, something which could have been lessened by an asymmetrically placed lace-loop seen in the Adios and Boston Boost. The lower section of tongue is a single layer, near-see thru mesh which is well ventilated too. Typical distance flat collar design. High Achilles with low side dips. Collar is soft synthetic, with foam squeezed into the top edges. 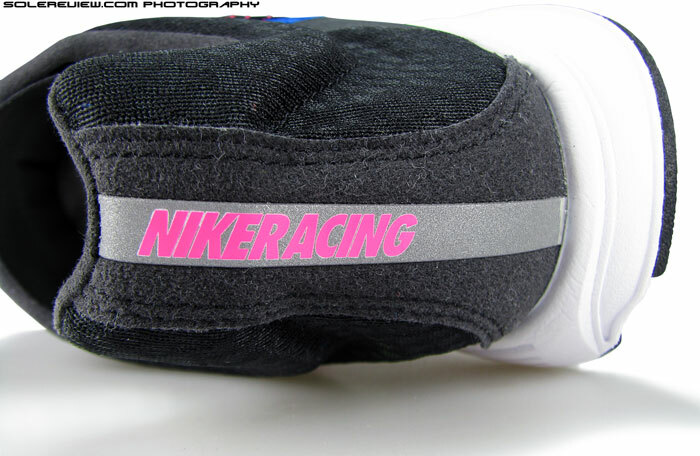 Collar is trademark Nike distance flat design, with low slung collar walls in relation to the high Achilles dip. 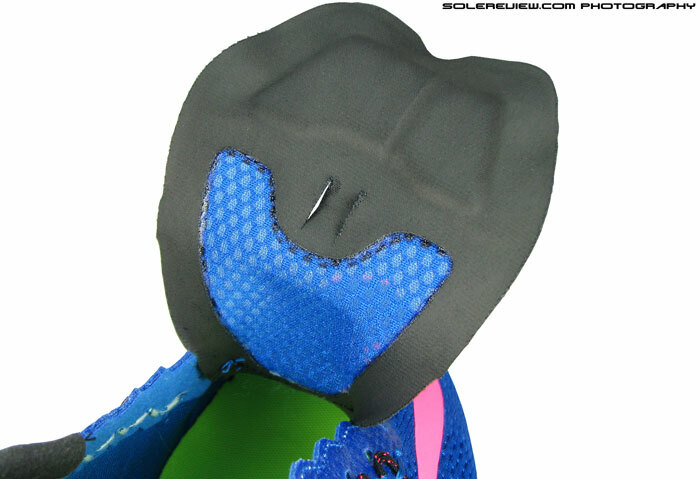 The inside collar is constructed with soft synthetic with a chamois-like hand feel, and there’s foam padding inside. Most of that padding is concentrated in the upper reaches, and not spread over a large area. The rear foot upper mesh is a thin, see-through type, similar to what’s used on the tongue, only more thicker. 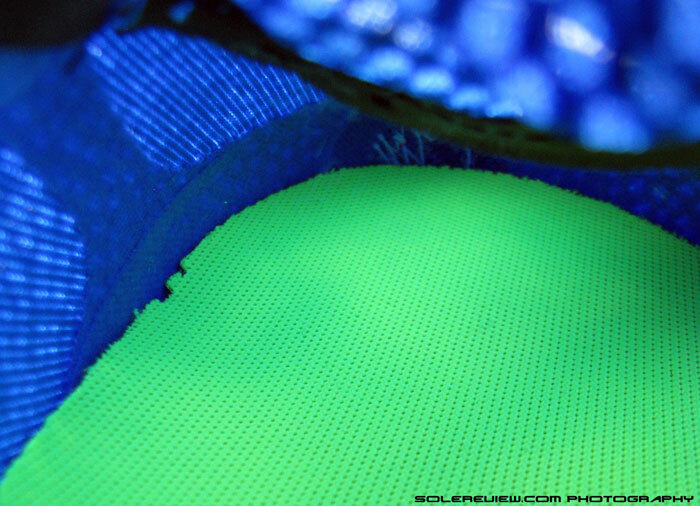 The Zoom Air bag can be seen through the strobel heel perforation. Sits right below the thin fabric strobel, so it’s pretty responsive. The insole is pasted to the strobel below, fixed position and not removable. 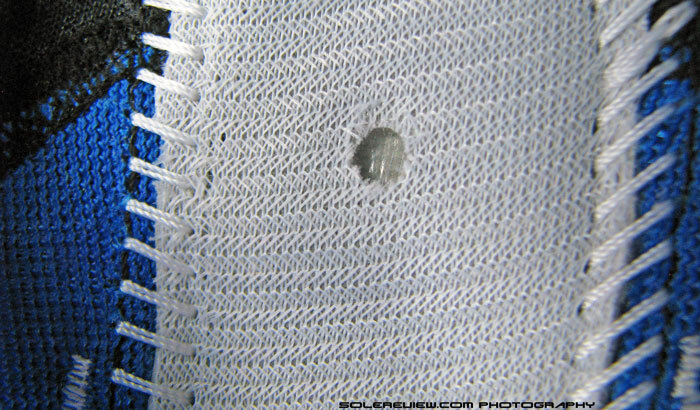 The insole is pasted by means of circular adhesive patches throughout. Noisy during walking speeds, as the dots sticks and unsticks from the strobel beneath. Midsole is compression molded EVA, its density bordering on firmness, yet with ample give. 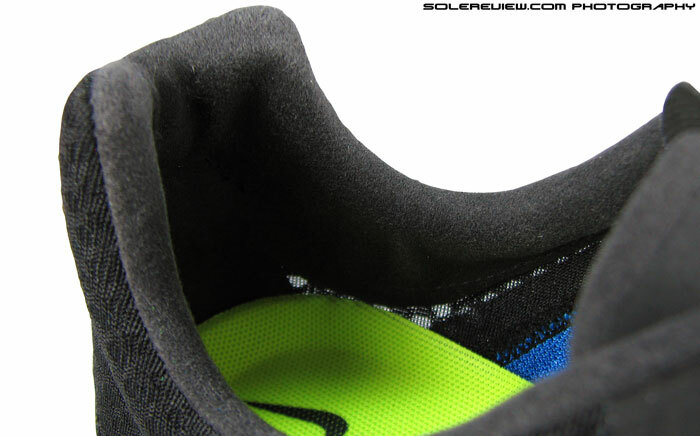 There’s a Zoom Air bag seated right under the heel, and beneath a thin, fabric strobel. The insole is contoured, but non-removable. 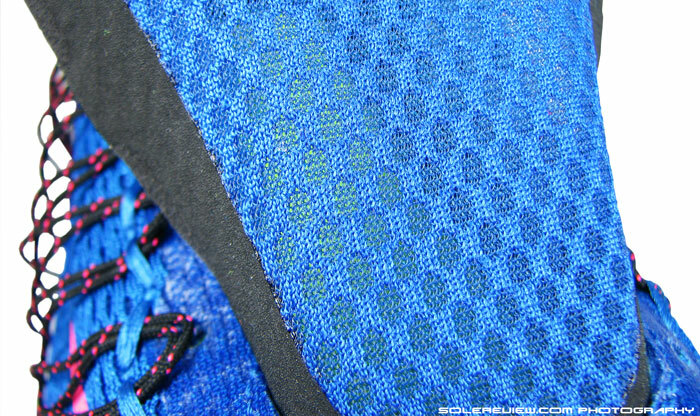 Circular dots of adhesives makes the footbed stick to the fabric strobel and part of the mesh upper. At walking speeds, you can hear the adhesive dots repetitively sticking and peeling away, resulting in a sound akin to velcro tearing. This is no issue when you’re running, but walking around in the Nike Zoom Streak on smooth floors sounds like you’ve got a piece of duct tape stuck under your heel. We discovered another drawback of the glued-on insole, but we’ll cover that last. The outsole profile follows the curved last, forefoot more wider than heel. Got blown rubber upfront (in pink), and carbon rubber under heel. The blown rubber layer under forefoot is quite thick, and should take as much abuse as a regular pair of trainers. The midsole has a transparent plastic shank cupping the waist. Nike takes the weight savings coming out of the minimal upper and applies it to bulk up the outsole. By which we mean there’s a generous amount of blown forefoot rubber under the forefoot – a huge one piece component with a couple of grooves running down the center. Not only is the coverage area impressive, the level of thickness matches up with what’s usually seen on regular trainers. In the back, a three piece set-up of carbon rubber does duties – and going by our experience with Nike outsole rubber, long term durability should be pretty good on the Streak 5. A transparent, plastic shank links the rear and forefoot, adding an element of midsole stability. Flywire cords are on the outside, which eases midfoot pressure. The cords are long enough for the loops to align with the eyelet holes, so the cincing isn’t as effective. There’s a noticeable amount of slack on the Flywire cords. Now the upper fit we were talking about – the mesh wraps around the forefoot without slack, but still manages to feel relaxed. For one, there are no external overlays squeezing the foot. Sure, there’s an invisible, internal toe bumper in the front and a mammoth ‘ meant-for-television’ Nike logo on lateral forefoot, but none of them box the foot in. The open, engineered mesh has some degree of stretch, which allows greater foot splay than say, a adios Boost or the much narrower Lunaracer 3. Secondly, also worth noting is that the Flywire cords only start doing their thing from second row of eyelets, skipping the first row. This is a good touch, as it eases off pressure on the side, contributing to the sensation of relaxed forefoot fit. The Zoom Streak is built on a distance racing last, so the midfoot is form hugging, more by the virtue of last contours than use of Flywire. The cords actually have some slack in them; even with properly done lacing, they don’t go taut. Having said that, the Flywire cords aren’t mere placebos. If you undo the laces and then re-lace without using the Flywire loops, the decrease in level of midfoot pressure is instantly noticeable. So if you like your Streaks even more relaxed, you do could skip the cords entirely. Don’t worry, they won’t drop to the sides. There’s a pair of guide tacks on the top, so those keep the Flywire cords from going anywhere – they just go a bit droopy, that’s all. The reverse side of tongue. The fused edges prevent the tongue from folding inside – a remedy to what we experienced in the Adios Boost. There’s no separate lining, but the smooth side of the upper mesh doubles up as one. Except for the tongue and eyestay seams, the innard is seam-less. Tongue feels smooth on top, which seems like a logical consequence of the choice of soft material used as lining. The same can be said about the mesh lining, which has a smooth surface. There’s no actual (2nd layer) lining used, it just so happens that the reverse of the sandwich mesh upper has a lining worthy texture. Collar is minimal but effective, snugness combined with pliable materials which gets the job done. The ride is well padded for a low profile distance flat. 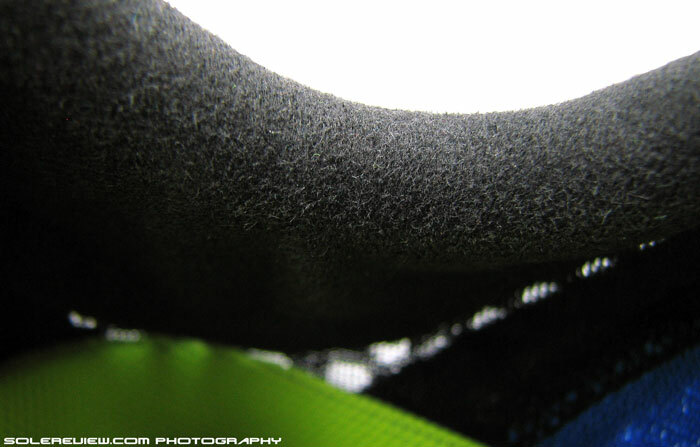 Heel cushioning is very noticeable, as the Zoom Air bag lies almost directly below the insole. If you’re a rear-foot striker, the presence of Nike’s proprietary cushioning system will be felt with each foot-strike. 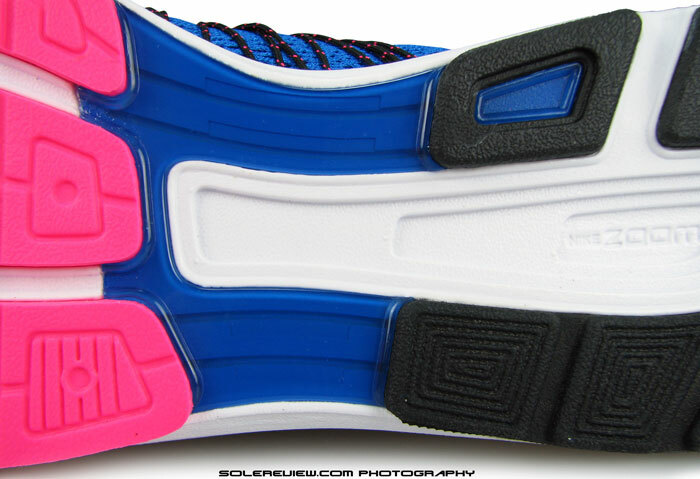 Rest of the midsole is EVA, so there’s an obvious mismatch as far as compression levels are concerned. This creates a very in-your-face, contrasting pocket of responsive softness right under the heel, while rest of the midsole foam is relatively firmer. Ride consistency isn’t the Zoom Streak’s strongest suit, something which is bettered by shoes like the adidas Adios Boost 2 or Boston 5. The midsole waist is fairly narrow, as typical of distance flats. But there’s no arch dig, helped by midsole compression and sockliner overhang. Being what it is, the Zoom Streak 5 has a narrow waist, causing the midfoot (and arch) to momentarily load over the thin midsole bridge during a gait cycle. Initially, we were a bit apprehensive that it would result in a midsole poke similar to what we felt on the adios Boost, but our fears were unfounded. The midsole foam is rather soft so it does not dig in, and it is padded over with the insole which overhangs and supports the under-arch area. Forefoot uses a soft grade of rubber which Nike calls Duralon (also used on the Vomero). This makes the front come across as fairly padded, so landing forefoot first isn’t jarring at all. Grip isn’t stellar though; the surface is smooth and lug free and doesn’t do much to help traction. It’s not like that the Zoom Streak 5 will slip, but we wish the lockdown was better. It’s pretty well ventilated in there. On the road, this is a great shoe to do long miles in. It’s got a relaxed upper feel, very breezy and cushioning is enough to be felt, but does not take away the ground feel. While we doubt this shoe will last as long as a Nike Pegasus 31, the Streak is versatile enough to be used in daily rotation – without worrying about shredding the precious forefoot lugs. And it isn’t very expensive too; at $100, it is $40 cheaper than the adios Boost and a twenty lower than the adizero Boston 5. There’s a lighter avatar available in form of the Nike Zoom Streak LT 2, but the Streak 5 is definitely the comfort version of it. We also took the Zoom Streak 5 to a synthetic track for wear-testing, and that’s where it loses some points compared to more ‘focused’ shoes like the Adios Boost. Let’s say you’re doing intervals. During sprints, forefoot striking feels a bit disconnected. The forefoot upper fit is a bit relaxed, and the big slabs of forefoot rubber outsole lacks any real bite. It’s okay in straights, but around the bends, you’d wish the forefoot was more ‘locked-in’, in a manner of speaking. This is where shoes like the adios Boost wipes out the Streak, with its ultra grippy DSP Quickstrike outsole and super snug forefoot. Needless to say, the best use for the Nike Zoom Streak 5 is on the roads, and not for tracks. The Streak LT 2 might be a better alternative for that kind of usage. 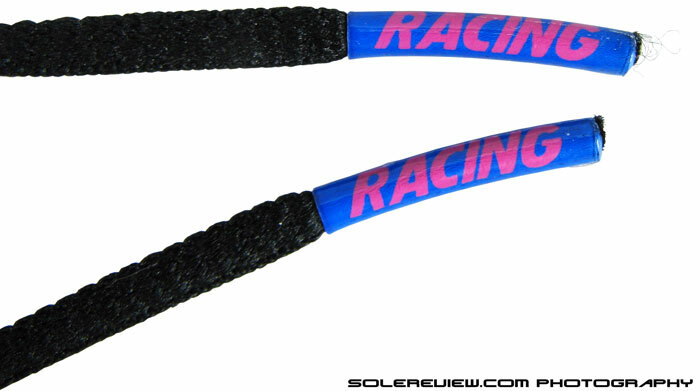 The lace aglets scream racing too. The Zoom Streak 5 is a good, all round performer, but still manages to throw up a couple of shortcomings. Not big bad ones, but undesirables nevertheless. First of which is that it’s uncomfortable to run barefoot in them. It’s a pity, since the mesh and tongue lining is super smooth, and great ventilation was the cherry on top. There’s a seam right at the start of the lacing u-throat – just ahead of the first row of eyelets. This is irritates the skin every time you flex the forefoot. Too many materials are layered in one place, making that area pretty thick and poke-y. Pretty self-explanatory. Inconsistent fixing of the insole across left and right shoes resulting in uneven overhang. Another minor issue we discovered was that irremovable insoles weren’t aligned properly across left and right shoes. The footbed overhang (picture just above) on the right shoe was greater than what’s on the left. This means that the entire right insole shifts a bit toward the medial (arch) side, leaving a smallish gap between it and the lateral upper. If you’re wearing thin socks, you’ll sense the lateral edge of the right insole underfoot. This is not an issue during runs, but it surely is a sign of faulty assembly. We understand that pasting a soft insole inside a shoe is tricky (and sticky) business, but then Nike is a $30 Billion company with a reputation to guard. Otherwise, a competent piece of running equipment with a lot going for it. Note on ratings: Our numeric scoring of 8.4/10 is based on a total of weighted averages. The attributes namely transition, stability and fit contribute to 69% of total scoring weight, which we see as more important than material (7%), cushioning (7%), traction (12%) and weight (5%). Hence the scores will not add up when a method of simple average calculation is used. Do you currently have a pair of Boston Boosts? Other than that they felt great on my two track sessions. I will probably use them for speed work and 10k races, not more. Thanks. We felt the Boston Boost was very snug in the forefoot – having said that, nothing can replace the fit of a true track shoe. The Lunaracer 3 could be an option for more snuggness, but the downside is that you lose a lot of ground feedback on those. What the terrain/surface mix like? In that case, you might want to consider the Boston Boost over the Adios. The Adios has a very thin forefoot, which means small rocks and the like will be felt through. Good luck with LR-3’s then! I currently have a pair of Boston boosts; I know the review is coming soon but how do they compare with the streaks? Boston Boost is much more snugger/shallower in the forefoot, pointy comparatively, for the same US size. Under arch dig similar to what was felt on the Adios Boost 2. Ride consistency is much better due to Boost foam, and forefoot outsole grip is better. On the flip side, Boston weighs 50 grams over the Streak. I really like what Nike are doing at the moment. They generally fit my feet better than Adidas and I find they provide an overall smoother ride. These run true and are a great 5/10km option for me, possibly also half marathon. I’m looking to add the ZE7 to the mix. How’s the fit on these compared to the Streak 5? A few friends have said the ZE7 feels roomy and long in the toebox (in the same size as the Streak). Would you consider sizing down? Finally between the ZE7 and the Peg 31, which do you guys prefer as a lively everyday trainer? Sorry for the delayed reply. The ZE7 was not available on hand (to compare) when you posted the comment. But now we do, so here you go. Yes, your friends are right about the sizing bit. There’s around 5 mm of space ahead of the toes and the medial side’s a bit roomy too. But would not advise downsizing, since the toe box is still shallow making the ZE7 ‘feel’ true to size. This is for the same US size across the Streak 5 and ZE. Between the ZE7 and Pegasus, we would choose the latter. The Pegasus is more cushioned, and since you already have a pair of Streaks, the Pegasus will throw in some welcome variation to the mix. Superb. Thanks again for your help. Thanks for the excellent review. You mentioned the inside foot insole pad is not removable. Can you use an orthotic with these shoes (for example – a custom full shoe length orthotic that improves arch support for over-pronators)? Thank you for the comment. Yes, the insole is stuck to the base, but can be removed without damage by applying a bit of pressure. The only potential concern we see with custom orthotics is they tend to be quite thick, and will eat into the already shallow and snugger fit of the Streak 5. The stock insole is rather thin compared to what’s seen in bulkier running shoes. Waist (center of midsole) of the shoe is rather narrow, so even if you insert aftermarket insole, the arch area will likely overhang the midsole area. 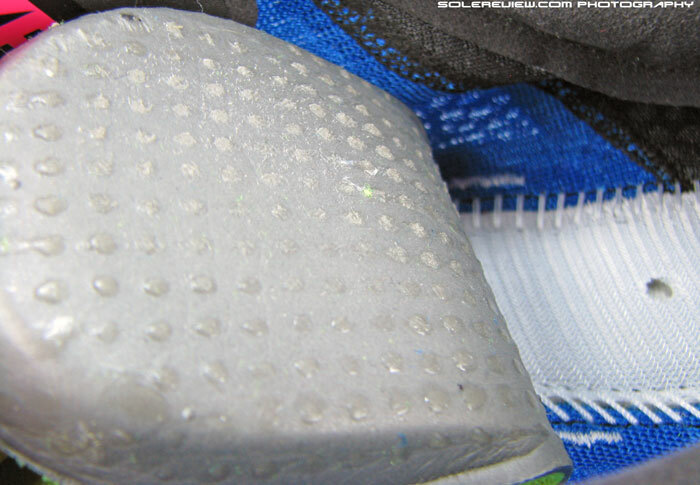 Our review shows how much of an overhang the existing insole has. You could try it nevertheless, but the points we mentioned are something you’d like to keep in the picture. Nice reviews and keep up the good work! Do you have much experience with the Flyknit Trainer+ (which looks to be possibly discontinued?) and/or Flyknit Racer? How might they fit in with Nike’s current road lineup when compared with the Streak 5 and Elite 7. I like the Elite 7 but looking for something a little lower in overall stack, a tad more responsive and with a better outsole design (no medial heel rubber on Elite 7 is problematic and never had pronation issues…just feels off to me and don’t like the rolling/rockered feel you get with the “crash rail” design on the lateral edge). 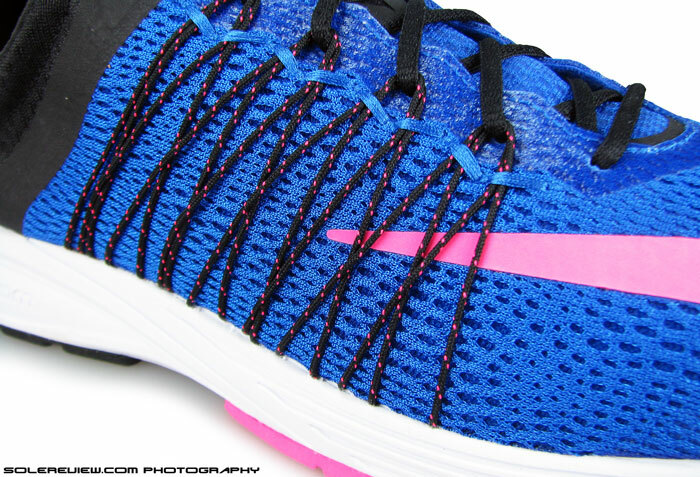 Would the Flyknit Trainers be more or less responsive than the Elite 7…from specs it seems they are lighter or would Racers be a better option (although at low 6 oz, they might be too light for a trainer). For reference, I tend to favor the minimal side of spectrum and use the adios boost as a trainer. Appreciate the comment, David! But can’t be of much help here, sorry about that. Don’t have any experience with the FL Trainer, and the last time we had a pair of Racers was a couple of years ago – our memory of that shoe is a bit hazy, and don’t want to send you in the wrong direction! No worries. Apparently the FL Trainer didn’t make great impressions on people as it is hard to find out info on it. 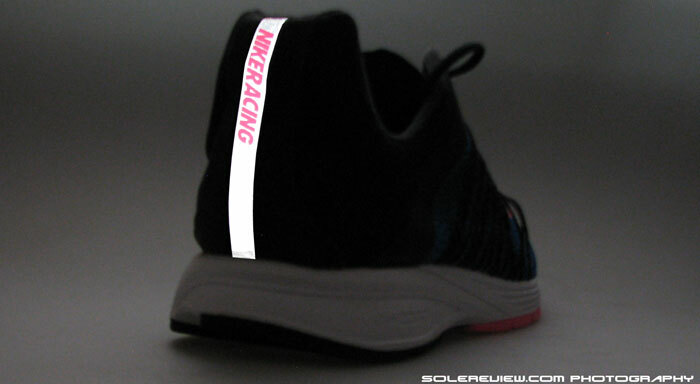 I’ve got the FL Racers coming in to try on from Running Warehouse so I’ll see how they feel. Thanks anyway! My Zoom Streak 4’s irritated me everytime I flexed foot and blister’s formed on top of my foot near where forefoot flexed. Would this be the same location you are talking about? If it is then, it would probably give me blisters again? I attribute it to a low height toe box. Yes, same place where the forefoot flexes. Thank you! Do you think a 1/2 size larger would solve the problem by creating a bigger toe box? Or would it defeat the purpose by also loosening the shoe where the heal would slip? Don’t think upsizing will fix the issue. The seams will just move to a different location, and like you said, the fit will become buggy. What an awesome resource! I just happened upon Solereview while digging for some info earlier today and I’ve spent most of my day on here since! So much more in depth and informative than a lot of the other reviews I’ve been reading.. Great job guys! Here’s something I was hoping you could help with – I’m a tall (~1.93), well built (~190lbs), marginal underpronator who runs mostly 10Ks & HMs. Over the last 2-3 years I’ve gotten used to low-ish profile, low to medium offset shoes such as the Kinvara 3s & Gel Lyte 33 v2s, both of which I owned multiple pairs of. Are the Streak 5s comparable to either of these 2? If not, which Nikes, in your opinion, are closest? I already own Flyknit 3.0s, Elite 6s & Vomero 9s but none of these really hits the mark. The Streak feels removed from the Kinvara 3 (haven’t reviewed the Gel Lyte so don’t have an opinion on that one) in the sense that feels flatter – more closer to a true racing flat than the Kinvara 3 is. Instead, you could try the 4mm heel drop Nike Lunar Launch, which in our opinion comes relatively close. That said, there are shoes like the new Nike Lunar Tempo to be released in a month or so, and we would think they might be worth a look too. Is lunar launch better than streak 5 for long distance running against addidas boost because it is 4mm drop ? In isolation, the heel to toe drop number has nothing to do with speed. There are many factors at play which result in a shoe feeling ‘fast’ or otherwise. Thanks for all this in depth information! I was just wandering how the zoom streak 5 compared to the Nike flyknit lunar 2 in terms of responsive vs less responsive cushioning, and any other notable comparisons. I was also wondering how the transition feels when doing shorter races such as 5ks. Thanks! 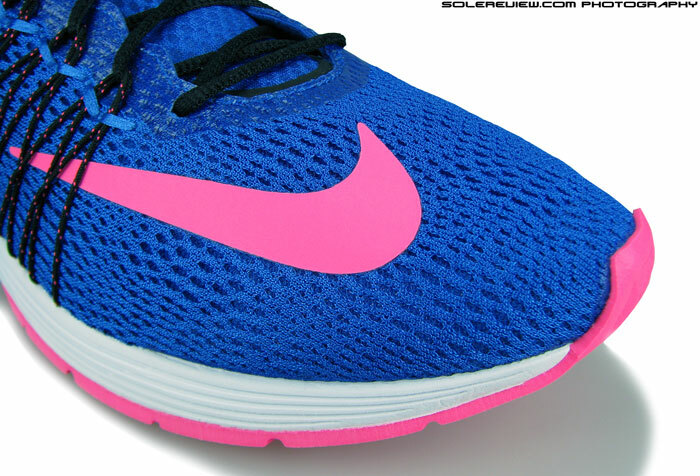 1) The Flyknit Lunar 2 feels more responsive overall due to an uniform spread of Lunarlon foam. The Zoom Streak 5 has a heel Zoom bag, but the ride comes across as flat, comparatively speaking. 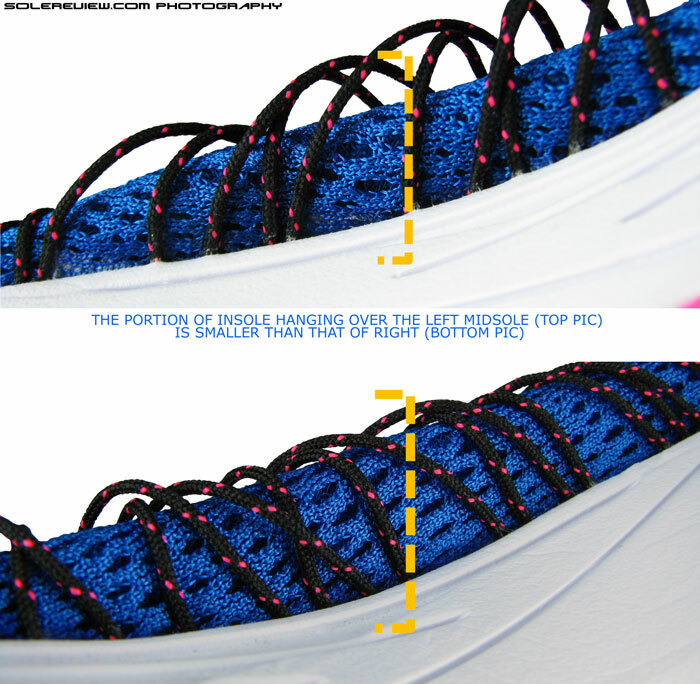 2) Transitions are more efficient on Streak 5 due to the lower profile (and firmer) midsole. 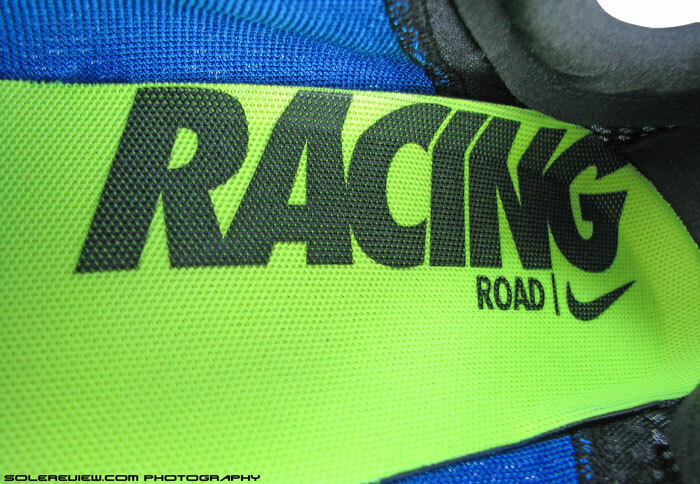 We would choose the Streak over FKL for races – they are much lighter and breathable too. I find the duct tape sound quite annoying but it got much better after about 50 km. I guess it depends on how sensitive you are to noise, the environment you’re running in and on your running technique. Anyway, except from that it’s one of my favorite running shoes now. Yes, that sound will disappear as the adhesive becomes less effective over miles. The Streak 5 is a good shoe though, no two ways about that. Really depends on how the terrain of 3 miles is spread out. If it’s most flat and dry grass/hard packed soil or gravel, the Zoom Streak will do. Throw in mud, or moist soil, then you might need to go for spiked or spikeless (depends on the outsole profile) XC flats. Great to hear that, and thanks for sharing the tip! What is the difference between this shoe and the nike zoom streak lt 2? The LT 2 is the lighter version of the Streak 5. Lower heel heights, a little more race focused forefoot outsole, etc. I run 5k road races, but I’m a heel striker. Which would you recommend? The streak 5 or the lt 2? We’d buy the Streak 5.
i sized up in the lunar tempo. would you do the same here? Yes, we would size up. Firstly, thanks for the info & the reviews, you, guys, are awesome. I am getting ready for my first half marathon and as a summary, I usually run up to 15K, twice per week on a comfortable pair of ZVomero 9 and my weight is 80kg. I am looking for a light racing shoes, very light but still comfortable and cushioning only for long runs between 15 and 21K, expecting a time around 1:45/1:50min (5min/km) in the 21K. What about this Streak5 for that purpose? Or is it better the LT? Any other suggestion would be more than welcome… Thanks a million! Don’t get the Steak if transitioning from a Vomero – get the LT, and you’ll be a happy runner! why get the lt over the streak 5 if transitioning from the Vomero? Are the streak 5 and Vomero too similar? I just bought two new pairs of shoes – the streak 5 and the zoom elite. I’ve been enjoying both, but was considering getting the vomero 10 for easy recovery runs. Do you think that would be redundant? Thank you for the comment. Just re-read our reply above again, and it does not make sense. We confused LT with LunarTempo instead of Zoom Streak LT – though the context by the original commenter was clear and implied. It is likely that the comment queue for that day had a lot of Lunartempo questions, and hence the mistake. The Vomero and Streak 5 couldn’t be anymore different. One is relatively flat and fast, while the other (Vomero) is a great shoe for long and easy. It won’t be redundant for sure. Ah, that makes perfect sense. Rereading their comment I think they might have meant the LunarTempo, not the streak LT like I thought. BTW thanks for the awesome reviews! I’ve been geeking out over your site the past week or so. Sorry about the incorrect suggestion below, another reader pointed out the mistake. We confused LT with the LunarTempo, whereas our recommendation should have been the Streak 5 instead. Between, Nike Zoom Streak 5 and Adidas Adios Boost 2, what do you think is a better option for someone who is a milk underpronator and presently runs in Asics Cumulus 16 & Adidas Energy Boost 2.0? There have been two instances of Shin Splints in the last 1 year (same left leg), but don’t know if the shoe is to be blamed for it. I want a 3rd shoes for the Half/ Full Marathon days. Why don’t you try the Nike LunarTempo instead. Will be a good transition from the Cumulus 16/adios while being seriously lightweight – nearly the same as the Streak 5 and lighter than adios. And goes fast too without sacrificing cushioning, which you might need during a 26.2.
can i use this shoe for preparing a marathon ? if i use one shoe for all : tempo run, speed run and competition ? Instead of the Streak 5, why not try the LunarTempo? The Streak 5 will flat/firm for daily training. Even the Lunaracer 3 isn’t a bad choice. The Streak 5 feels nice as a race day shoe, though. Thanks for the detailed review. I have a training shoe; new balance 890v5, for speed runs I use my old nike lunarswift 3. For competition I am willing to buy nike zoom streak 5 or new balance fresh foam zante. I tried both shoes, I liked nzs5 more, but as I had a knee surgery 3 years ago, I wonder if the low cushioning of nzs5 might be risky or does it seems to have what it needs to protect an amateur runner? You can check with your physio, but in our opinion, the Streak 5 is cushioned enough for the occasional race-day. thanks for the quick reply and the great reviews. Hi there, love your reviews and helpfull answers to all the questions in the comments! I’m currently training for a spring marathon. The last few months I’ve been running shorter distances (5K-15K) on Adidas Adios Boost 2. I love those, but I feel like a need a shoe with just a bit more cushioning for the slow long-distance training that I currently do. Based on what I read online, both the Nike Zoom Streak 5 and Nike Lunaracer+ 3 are great marathon training / race shoes who are comparable to the Adidas Adios Boost 2 (light weight, neutral) but come with more cushioning, so those sound great to me. 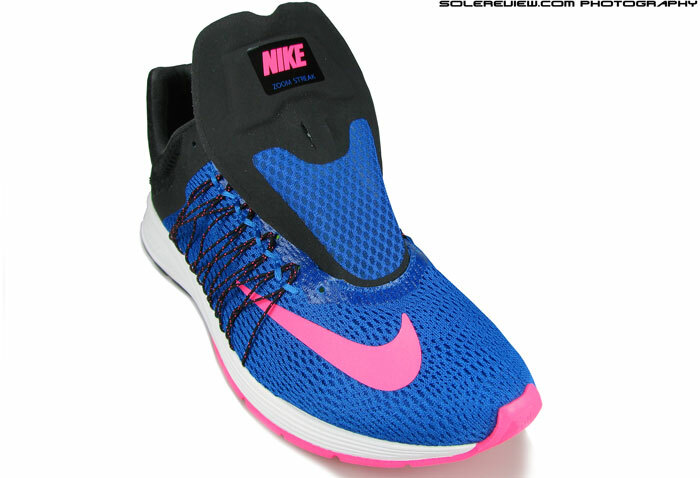 I can’t find out however what the differences are between the Nike Zoom Streak 5 and Nike Lunaracer+ 3, and what would be the better choice for marathon training and the race itself, can you help me out? 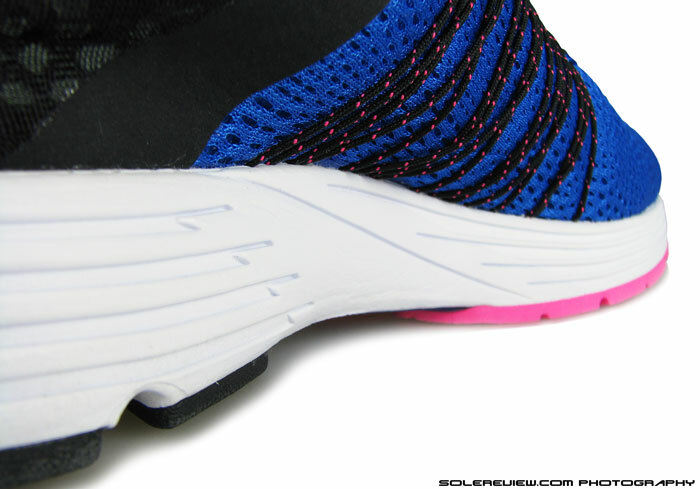 The Zoom Streak 5 has the least amount of cushioning between the three (the other two being adios and Lunaracer). So you could either get the Lunaracer 3, or the adidas Boston 5 Boost ( a slightly more built up version of the adios). So, I LOVE the NB 1400 for all distances (1/2 is furthest so far) and speeds (i average 6:15-6:30), and don’t put much thought into tempo or training, I just love to run, and I love to try new shoes, especially in an occasional race. I also loved the adios boost 2 for longer distances, but it was just a bit much shoe for me. I’ve also had a love affair with the NB 5000 and Mizuno Wave universe, but I’m moving away from ultralight flats. That being said, which of the 3 above would be a fair compromise given this info? I like a more responsive shoe that doesn’t feel dead (like the nike free flyknit or sometimes the NB1400), but I also like less cushioning, so I stay away from the fresh foam and of course, Hoka. I don’t mind a higher heel:toe offset, in fact I tend to run better in the 6-9mm range. I also am ok with a bit of stability, as I have flat feet, and overpronate just slightly. The NB1500 makes sense on paper, Zachary. Above the 1400 in cushioning, feels responsive, and has the drop in your range.